After my cocktails at SWIG, I was ready for a bite to eat. 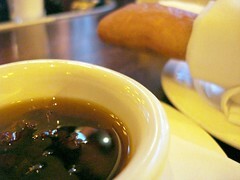 On the way to SWIG, I’d passed a place that looked rather lively and inviting, so I made my way back to The Grand Café. I entered into what was actually the adjoining Petit Café. The crowd was lively, perhaps fueled partially by the cocktails that had been consumed earlier in the evening. The bartenders were friendly and greeted me promptly. 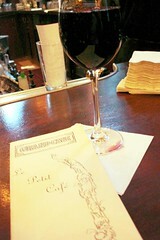 I found a seat at the smallish bar and ordered a glass of wine. While perusing the menu I was served a lovely little baguette with a side of olive and sun-dried tomato tapenade. I’m am not normally big on tapenade. It’s okay but not something I crave. This version was really good. I found myself dipping back into the little dish over and over again. Soon after settling in I was in conversation with the bartenders and the other folks at the bar. A woman, previously seated in the dining area, made her way down to the bar and squeezed into the last seat so she could join in. Although she was a nice person, she was one of those people who can’t just order from the menu. Every single thing she ordered had to be tweaked and modified in some way! I was so amazed as I listened to her go through her list of questions and requested modifications. Do you remember the scene in "When Harry met Sally", where Meg Ryan is placing an order? This woman was Meg Ryan squared! Through it all the bartender simply did everything he could to accommodate her. I ordered a shrimp dish, which turned out to be okay but not great. However, I’m not sure I should judge the place on this dish. Apparently, they were actually out of what I’d ordered and the kitchen put together a reasonable facsimile. I didn’t really mind but I think the original dish may have been better. Although I had mixed feelings about the food, the friendly atmosphere of the place would bring me back again to see if there were menu items that I might prefer. If nothing else I could just sip a glass of wine and munch on the bread and tapenade!